This is easily one of the best looking phones we've seen. It’s not the slimmest and it doesn’t have an exceptional build or finish. But as soon as you look at it, how big and how tall become instantly irrelevant. For the record though, the Nokia N9 measures 116.5 x 61.2 x 12.1 mm and weighs 135g. The Nokia N9 comes in a box barely bigger than the device itself (Apple, anyone? ), but the small size doesn’t mean it's not well-stocked. Under the usual set of manuals, you'll find a compact, oddly shaped (though still good looking) charger that connects to the microUSB cable to charge the phone. The single piece headset looks quality too. Now did we mention the Nokia N9 is a pleasure to look at. Equally impressive though, the design of the hardware complements the software and that's a big part of the fluid user experience. If you like minimalist designs, the N9 is the ultimate. There are as little hardware controls as humanly possible. The whole thing is symmetrical, organically curved and beautifully simple to use. The Nokia N9 has a unibody design, which usually implies metal, but the Finns went for premium-quality polycarbonate instead so we don't think too many people will mind. The body seems very sturdy, it can take a few knocks and not show it. The Corning Gorilla glass over the display and the plastic itself make sure of that. The polycarbonate is colored itself rather than painted. No peeling paint issues and even a deep scratch won't reveal anything but the same color as the rest of the body. 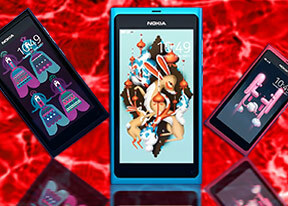 Speaking of which, the Nokia N9 comes in black, cyan or magenta. The main attraction of the Nokia N9 is the display. In fact, it's more or less the only thing you interact with when using the N9. Nokia's other AMOLED offerings are pretty good, but the nHD resolution is on the low side. The N9's screen boasts all of their advantages (namely, great contrast, colors and image quality) and pushes up the resolution. It's a 3.9" AMOLED unit with FWVGA resolution (meaning 480 x 854 pixels). Our investigation revealed it uses a PenTile matrix - meaning each pixel has two subpixels instead of three - but the high 251ppi pixel density means that most people wouldn’t notice it. Indoors, the viewing experience is great - the display is basically glued to the Gorilla Glass on top, which makes it look almost as if the icons are painted on the surface of the handset when you look from an extreme angle. The screen continues to impress outdoors in the sun too - it remains perfectly visible, while the colors keep most of their punch too. The anti-glare polarizer is certainly working well as the N9 is probably the least-reflective screen we have seen. The Nokia N9 touchscreen is very responsive and the edges of the scratch-resistant glass that cover it are convex (the display itself is flat). This is essential to working with the MeeGo software as swipes usually start at the very edge of the screen. This is probably the most common gesture and the curved glass makes it nearly effortless. One nice perk of Nokia AMOLED phones is present on the N9 too. The clock is visible even when the device is locked. The clock is perfectly visible in the dark and draws very little power. We measured the maximum brightness of the N9's screen to see how it stacks up against other AMOLEDs and the LCDs. As usual, contrast is theoretically infinite though reflections mean it's practically some really high number. The low reflectivity of this particular screen makes it that much impressive. As for the brightness, the Nokia N9 has one of the brightest AMOLEDs we have seen. In falls only marginally short of the X7 screen, which tops our charts.